2 Jewish fathers lost their daughters in the Parkland shooting. Now they’re fighting on different sides of the gun debate. (JTA) — Jaime Guttenberg and Meadow Pollack shared many similarities. Both were brown-haired and bright-eyed girls, beloved by friends and family. Both were passionate about their hobbies. Jaime, 14, spent her free time dancing and volunteering with special needs children. Meadow, 18, was a girly girl who loved the outdoors. At a young age, the two South Florida Jewish teens already had a clear idea of what they wanted to do with their lives. Jaime wanted to be a pediatric physical therapist and hoped to work at the Paley Institute, a world-renowned orthopedic center in West Palm Beach. Meadow was planning to study law at Lynn University in Boca Raton. Both girls were at school on Feb. 14 when a former student entered Marjory Stoneman Douglas High School in Parkland with an AR-15 semi-automatic rifle and started shooting. The gunman, Nicolas Cruz, killed 17 people, including Jaime and Meadow. That bloody day forever changed the lives of their families and the Parkland community. Some of the student survivors founded a movement to advocate for gun control. Jaime and Meadow’s fathers have become prominent activists, each amassing tens of thousands of followers on Twitter. But as similar as their daughters appeared to have been, the two fathers’ messages are opposite in many ways. Fred Guttenberg, Jaime’s father, supports gun reform and is urging people to vote Democratic in Tuesday’s midterm elections. Meanwhile, Andrew Pollack, Meadow’s dad, is a supporter of President Donald Trump and says that those urging gun control distract from his goal of making schools safer. JTA spoke with Guttenberg just after a synagogue shooting brought up searing memories of the Parkland attack, and Pollack a few days earlier. News of the Pittsburgh massacre on Saturday that left 11 people dead brought Fred Guttenberg back to the aftermath of the February day when his life was shattered. “I’m horrified this weekend by seeing a repeat of what happened after my daughter was murdered, which is elected leaders who either are silent or won’t say the reality, which is this was a gun issue,” he told JTA on Monday. Guttenberg, a 52-year-old businessman, hasn’t worked since the shooting. Instead he spends his days fighting for gun reform as a way to keep alive his daughter’s memory. In the past weeks he has traveled throughout the country to attend and speak at rallies for politicians ahead of the midterm elections. Prior to the shooting, Guttenberg was not politically active and felt isolated by two parties that he saw as moving toward extremes. “I was nothing more than somebody who used to sit at my television and scream when I would see these elected leaders,” he said. Now he feels differently, at least for the midterms. Despite his endorsements, Guttenberg is not comfortable describing himself as a Democrat. He said he is planning to register as an independent after the midterms (he would not disclose his current party registration). He has met with Ohio Gov. John Kasich, a Republican presidential candidate in 2016, and said he would endorse the politician if he were up for re-election. Although Kasich has an A rating from the National Rifle Association, he has proposed various gun policy changes. Jaime’s death isn’t the only tragedy the Guttenberg family faced recently. Four months before the Parkland shooting, Guttenberg’s physician brother died from cancer that he developed as a result of treating victims at the site of the 9/11 terrorist attacks. Seeing his brother fall ill challenged Guttenberg’s Jewish identity. “I was pretty angry,” said Guttenberg, who grew up in a Conservative Jewish household but started identifying with the Reform movement as an adult. Then, less than four months later, his 14-year-old daughter was taken from him and the rabbi’s argument no longer made sense. Fighting for gun safety is his way of preserving Jaime’s memory. He supports a range of policies, including raising the age limit to 21, passing legislation to allow law enforcement to take away weapons from certified domestic abusers and those spreading hate online, and improving background checks on guns and ammunition sales. “None of them are anything along the lines of overturning the Second Amendment or taking away the guns of lawful gun owners,” he said. Guttenberg dismisses arguments — including by Trump — that armed guards would have prevented shootings such as the one in Pittsburgh. Politics also did not play a big role in Andrew Pollack’s life prior to February. He voted for the first time in 2016. A passionate supporter of Israel, he was energized by Trump’s promise to repeal the Iran nuclear deal. Still, the real estate manager didn’t spend too much time fretting over politics. “I’ve never been a political guy,” he told JTA last week. Then his daughter was shot nine times in the hallway of her school. Her body was found in a way that suggested she shielded another student from the gunfire. Both were dead. Pollack, 52, recalls turning on the television after the shooting and hearing talking heads speaking about gun control. He felt as if the media were diverting attention from what had actually led to his daughter’s killing and started researching school safety policies in Broward County. “As I started looking into it, I started seeing these policies that are in place in Broward that created this whole nightmare,” he said. One of those policies was diversion programs, which are intended to allow first-time offenders or individuals with a minor criminal history complete rehabilitation programs rather than be convicted and have criminal records. The Parkland gunman Cruz participated in such a program in 2013, when it was introduced by the county’s school district. Cruz was referred to the program after damaging a sink in a school bathroom. He threatened multiple times to harm himself and others, and was expelled multiple times from school. But it is not clear that anything he did constituted a crime. The safety commission at Marjory Stoneman Douglas High dismissed claims that the diversion program he had attended failed him. Pollack also questions why Cruz was let onto campus on Feb. 14, despite having made threats to blow up the school. “All those people that are in Parkland are talking about gun control, but they’re OK with all the administrators that didn’t have this kid arrested for trespassing at the school after he already threatened to shoot the school up,” he said. “The Democrat mind is simple: ‘Let’s just go after the gun.’ It’s easy to blame the gun,” he said. Pollack would rather focus on improving school safety and prevention. He supported a Florida bill that put armed guards in every school in the state, provided increased funding for mental health care and raised the age to buy a gun from 18 to 21. He also founded Americans for Children’s Lives and School Safety, a group that supports parents seeking to improve security measures at their children’s schools. Twice since February he has visited the White House to urge Trump to adopt policies to improve school safety. He will be back again in December as a guest at the annual Hanukkah party. At home, he is close with his local Chabad rabbi, Avraham Friedman. The Chabad House has donated land next door to build a playground in Meadow’s memory. Looking at the two fathers, one can’t help but wonder if they symbolize something larger. National tragedies tend to be moments of unity, pushing people to overlook their differences in common mourning, at least for the moment. But in recent years, the opposite seems true. Each shooting leads to more finger-pointing and cries that the other side is using it for political gains. There seem to be two Americas, each one viewing current events through such a thick lens that it is unable to even comprehend what the other side is seeing. Despite their political differences, Guttenberg and Pollack share one wish: To go back to a time when their families were whole. 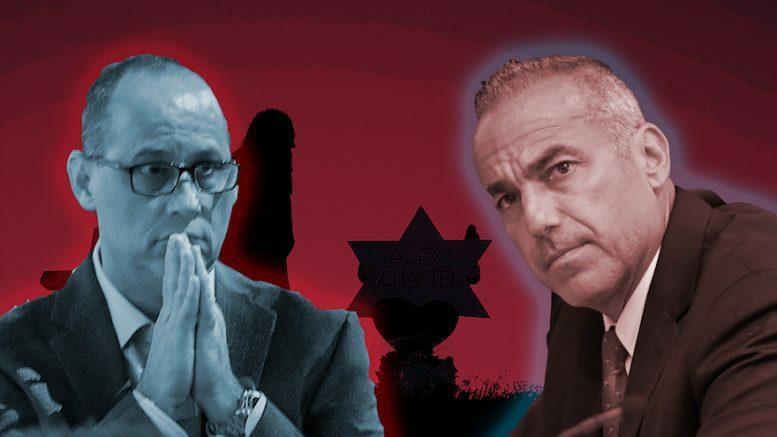 Be the first to comment on "2 Jewish fathers lost their daughters in the Parkland shooting. Now they’re fighting on different sides of the gun debate."